Arsenic, a known carcinogen that causes several types of cancer, is a growing problem in Maine’s drinking water. And one University of Southern Maine (USM) School of Nursingstudent wants people to know about it. Brent Kraushaar, a senior in USM’s Accelerated Nursing program, has launched an awareness campaign focused on the chemical properties of arsenic and its ability to contaminate Maine’s drinking water wells. Through the USM School of Nursing’s L/A Community CARE Partnership — a clinical program that focuses on public outreach regarding cancer prevention — Kraushaar has produced a 15-minute webcast highlighting the dangers of arsenic, which he says is considered the world’s most significant chemical drinking water contaminant. “My personal project this semester focuses on providing public education regarding arsenic contamination in private drinking water wells, and about new state money available to help financially disadvantaged Mainers treat/test their water,” he told the Fiddlehead Focus, which highlighted Kraushaar’s project in late June. Arsenic, an odorless, tasteless element, is known to cause cancers of the skin, bladder and lungs, and has been found in dangerous levels in the groundwater in several regions of the state. 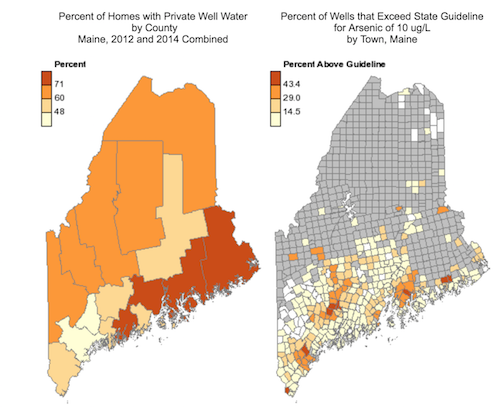 Some of Maine’s water wells, Kraushaar said, have tested at over 50 times higher than the maximum “safe” concentration of of 10 micrograms per litre (mcg/L). Kraushaar, 30, came to Maine from Southern California with the desire to live somewhere new and exciting, and was drawn to Southern Maine’s abundance of nursing programs. He said USM’s accelerated program was his best option. “I’ve kind of always toyed with the idea of something health-related. I became an EMT and worked on an ambulance for a while and just decided this is the career I thought I would enjoy seeing myself working in,” he said, adding that his wife is also a nurse. Previously, in Southern California, Kraushaar worked in government air pollution control. There, he inspected pollution-emitting facilities, reviewed environmental impact reports and calculated emissions in a variety of settings. That interest in environmental pollution, he said, poured over into his interest for examining arsenic once he came to Maine. The CARE Partnership, one of many within USM’s School of Nursing, partners students with professionals, members and organizations of Maine communities to share and teach cancer prevention strategies and awareness in a variety of settings with the overarching goal of promoting health and wellness. Students may work in middle schools, high schools and on college campuses; in senior centers; within workplaces and in recreational settings where they gain experiential knowledge. Cynthia Randall, assistant professor of nursing at USM and instructor of the CARE Partnership, said the program exposes students to diverse communities with various socioeconomic, ethnic, political and ideological backgrounds — an experience that puts them ahead of the curve for when they graduate. For Kraushaar — who will receive his bachelor’s degree at a pinning ceremony in late August — the time spent working with community populations gave him a deeper knowledge of Maine’s people, and what their needs are for care. The CARE Partnership also taught him that nursing is a more complex profession than most generally assume. That understanding, Randall said, is another benefit of the CARE Partnership and USM’s other community nursing programs. Watch Kraushaar’s presentation, “Arsenic in Public Drinking Water Wells: What You Should Know,” below, and call the Maine CDC public information line at (207) 287-4311 or visit the Maine CDC website for more information and factsheets.